Look for the Seahawks to upgrade the tight end position this draft. Throughout the season the Seahawks tried to find a pass catching tight end through Kellen Winslow Jr. and Evan Moore, but that didn’t work out. The specific position that they’re looking for is a “joker tight end.” That is a tight end that is able to move around the line, part wide receiver, part tight end, and part fullback. 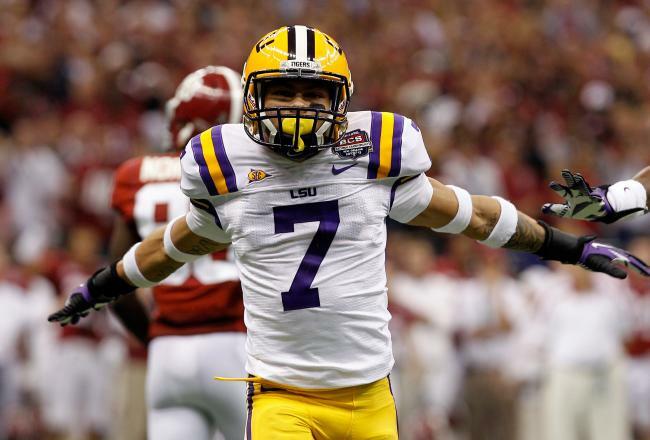 One of the best “joker” tight ends is Aaron Hernandez. The ability to have someone his size moving all around the line to creates mismatches for opponents. A prospect that I can see Seattle go after to fill this need is Jordan Reed. Jordan Reed is often compared to Aaron Hernandez. Yes they did go to the same school, they are the same height, and they run about the same forty time. However when it comes to production coming out of school Aaron Hernandez was more productive. However Jordan Reed converted to tight end from quarterback, meaning he’s still a work in progress. One thing that intrigues me is that Aaron Hernandez is helping train Jordan Reed. Hopefully he ends up being his protege. If Jordan is available in the 3rd or 4th, look for this team to consider him. Watching Jordan Reed’s tape you notice that he’s a fluid athlete. He shows he’s a great receiver, having the ability to adjust to catches and to run after the catch. He finds open spots in the defenses. What he needs work on is his blocking ability. He tends to get thrown on the ground by defensive linemen. I think this is a great signing for our team. At the beginning of the season Pete Carroll addressed that finding multiple pass rushers were a must, so he went out and got one in Cliff Avril. Over the past three years, he’s racked up 29 sacks and 9 forced fumbles. With Chris Clemons coming off an ACL injury, we won’t know when he’ll be back. So coming into summer camp look for Cliff Avril to be the starting leo for the Seahawks. This move also allows Bruce Irvin to develop into his role as the possible leo or as just a pass rushing specialist that comes in on third downs. Avril is 27 years old and entering into his prime years of his career. Signing Avril to a two-year, 15 million dollar contract was a great deal rather than a 4 or 5 year contract. It allows us to then decide what to do within the next couple years without worry about the cap space because in a couple of years, we’ll have to resign our young stars, such as Russell Okung, Earl Thomas, Richard Sherman, Russell Wilson, and Kam Chancellor. With Pete Carroll and John Schneider getting a wide receiver and leo, look for the draft strategy to change. I primarily look for us to go with WLB, DT, TE, and CB with our top picks. Players such as Arthur Brown, Khaseem Greene, Sio Moore, Zavier Gooden, Kawann Short, Jessie Williams, Sylvester Williams, Brandon Williams, Gavin Escobar, Vance McDonald, Jordan Reed, Zach Ertz, and Tyrann Mathieu could all be in play for our top picks. Mathieu is a talented playmaker. He’s about 5’9 running a 4.5 forty. His role in the NFL would be primarily a nickel corner and punt returner. His career stats in college for two years were 133 tackles, 16 tackles for loss, 6 sacks, 4 interceptions, 11 force fumbles, and 19 pass deflections. For punt returns he averaged 17.2 yards and two touchdowns. 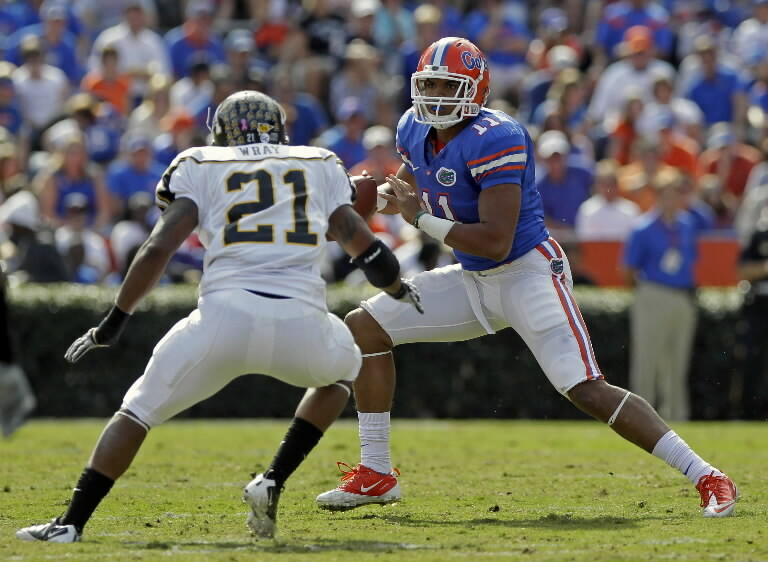 Awards that he’s won in 2011 were Chuck Bednarik Award, 2011 All-American, and a Heisman Candidate. I think he’s a perfect skilled player for our defense. He’ll get an opportunity to come in to compete for the nickel back position. A position Marcus Trufant played last year. That position is for someone that is usually smaller and quicker, so they have the ability to cover the slot receivers. With Trufant most likely not coming back and Walter Thurmond not being able to stay healthy, look for the team to bring in another element for that position. We all know the Pete Carroll and John Schneider lover their players to have a special element to their game. Mathieu offers that special element to the nickel position. He’s an aggressive tackler that doesn’t back down from anything. He has a knack for stripping the ball, and he’s very good at it. Even though he likes to strip sometimes it can often lead to miss tackles. He has great blitzing ability. In coverage he’s instinctive and aggressive, however sometimes he’ll bite on the double move when on man coverage. He’s more of a quick instinctive player, than a straight-line speed guy. In the punt game he has great feeling of space allowing to know where his blockers are. All I got to say is “WOW,” John Schneider and Pete Carroll are at it again. The addition of Percy Harvin makes Seattle a real contender for the Super Bowl next year. To bring in a playmaker of Percy Harvin’s ability is what this team is missing. What Percy Harvin brings is a versatile playmaker. A player in his NFL career has a total of 7,168 yards with 29 touchdowns. He is a do it all athlete that this team desperately needed. Yeah it hurts that we gave up a 2013 first round pick, 2014 third round pick, and a 2013 seventh round pick, but we get proven player in the league at a young age of 25 years old. Harvin is return specialist, receiver, runner, and pretty much an opponent’s worse nightmare. Imagine having to defend a read-option with Percy Harvin, Beast Mode, and Russell Wilson, the creativity that we can get out of these guys will be unbelievable. 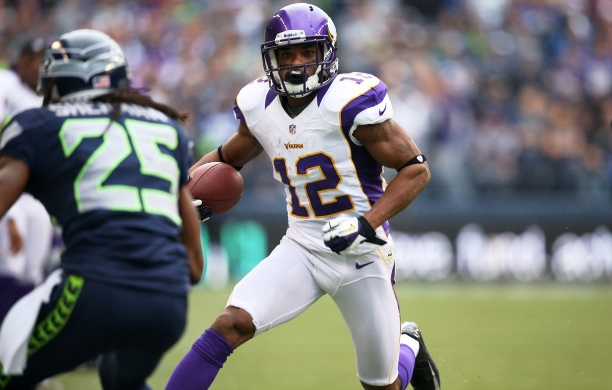 The negative about Percy Harvin is his injury history. He hasn’t played a full season, since coming to the league. He’s also had some problems with his previous coaches and front office in Minnesota. Also with him being in his final year of his contract, he’ll be expecting a big pay raise. What a great start to the offseason! One more day until the NFL Free Agent period starts, hopefully their will be more good news to come in the weeks. 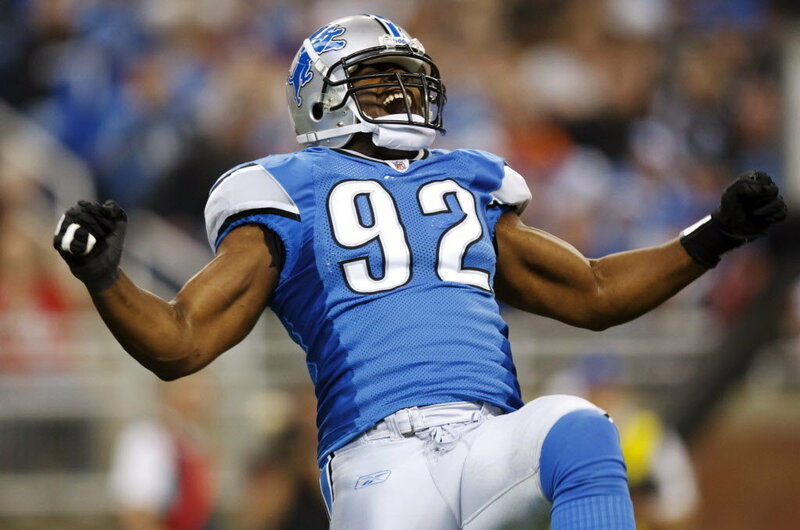 There has been a buzz that Seattle has serious interest in Datone Jones. You look at a player who is about 6’4, 283 that runs a 4.80, 40 time. Jones will be a player like Jason Jones, someone you can put in the inside, but also move around to the defensive end position. I watched a lot of Pac 12 football games, but I never really saw Datone Jones stand out, it wasn’t until the Senior Bowl. At the Senior Bowl she displayed his quickstep and hands to get around the tackles. Look for Jones to a consideration for the Hawks. Eric Winston was officially released, therefore I see them going Joeckel where he can play on the opposite side of Branden Albert. They traded for Alex Smith so no need for a quarterback. Joeckel is the top tackle in the draft. With Gus Bradley being a defensive minded coach he’ll want to start rebuilding with the defensive line. Jacksonville was dead last when it came to sacks. Coming from Seattle, look for Bradley to have a blueprint of bigger, faster, stronger, players. 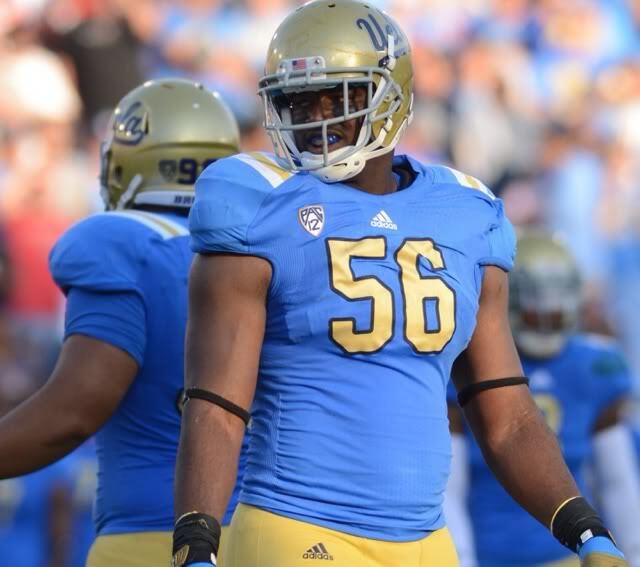 Jordan processes great speed and height for a defensive end. Oakland is a mess. They need help in a lot of positions, but being well over the cap doesn’t help them. Defensive tackle is the most needed position with both Desmond Bryant and Richard Seymour hitting free agency. Could go also go corner, but Fisher makes the most sense. He’s been rising fast ever since the senior bowl and combine. Some people might think that he’ll have a better future than Luke Joeckel. Detroit is badly in need of cornerbacks. Chris Houston and Jonte Green are not starting cornerbacks in this league. With the top available cornerback available, they jump on it. The Cardinals are desperately in need of a quarterback. They had to keep rotating the quarterbacks last year and that didn’t work out well. I honestly think that they’ll go with Barkley because his IQ of the game will attract Bruce Arians to fall in love with him. I can’t see the Bills passing up the opportunity to take Geno Smith. They are in need with of a quarterback with Fitzpatrick being a disappointment ever resigning a huge contract. Imagine Spiller and Smith running a read option play, deadly combination. Looking at the Jets roster they could use a rush linebacker in their 3-4 defense. Mingo brings great athleticism to the rush linebacker position. The Titans are in dire need of OLine. They need to find way to open holes up for Chris Johnson. Cooper is the best offensive guard available. Looking at this team there are not many holes. Our needs are the dline, wide receiver, tight end, weakside linebacker, and nickel corner. With the team having ten picks in the draft, it makes the first round pick expendable. If you seen the way this team drafts, we get our best values in the later rounds. For example Richard Sherman (5th round), Kam Chancellor (5th round), KJ Wright (4th round). This team knows how to draft talent later on making the first round not a concern. 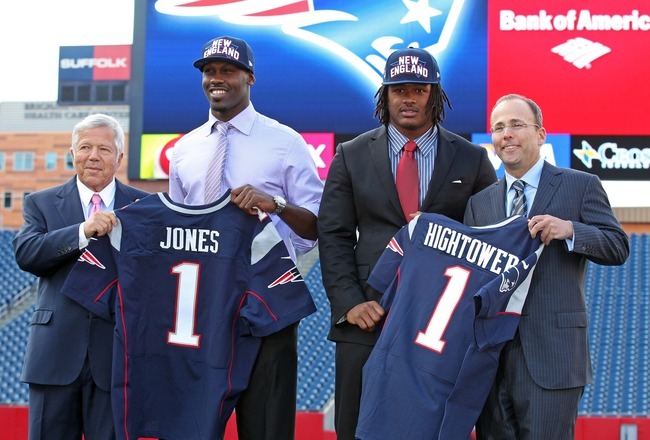 You look at a team like the New England Patriots, over the years they’ve been able to stock pile picks due to trading away their first round picks or moving back in the draft. In 2010, 2011 they had five picks in the top 100 and in 2012 they had four picks in the tope 100. Imagine if the Seahawks had five or four picks in next year’s draft. They would be able to stock pile a lot of talent for the years to come. The perfect scenario is for the Seahawks to trade down, possible get future first round pick an addition later round pick in the 2013 draft. With that it allows us to have two first round picks in next years draft and another pick in later round where we do the best damage on getting quality sleeper players. Also with next years draft being filled with many star quality players like, Jadeveon Clowney, Sammy Watkins, Marquise Lee, it allows us to possible move up to make a big pick. If not it still allows the team to possibly trade one of the two first round picks. The possibilities are all positive endings. The Clemson junior wide receiver is the real deal. He finished his season with 1,405 yards and 18 touchdowns, posting 100-yard games six times. He’s neither the biggest receiver nor the fastest, but he brings heart and hard work to the game. He has great hands and great routes. 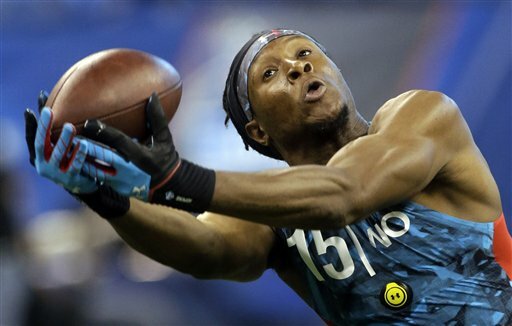 At the combine Hopkins displayed his great hands during drills, especially the crazy fingertip catch on a deep ball from MarQueis Gray. Hopkins did however test poorly in the 40 yard dash, running a 4.57. He did have some great measurements with 10” hands and 33 3/8 arm length. One of the most impressive games I saw of Hopkins was the LSU game, posting 191 yards with two touchdowns. Watching the game you can see the great hands and route running that he displays. The way he’s able to extend his arms out to grab the ball is amazing. He doesn’t wait for the ball to come to him and he doesn’t catch with his body. He has unbelievable hands; he didn’t drop anything in this game. Even though he doesn’t have the speed you like, he is reliable. I’ll take a reliable receiver that’ll make the great routes and catch everything over a speedster, who is inconsistent when catching and having good route running ability.